Rich in Monounsaturates. Pure vegetable-based Skin Emollient*. Cayce Recommended Massage Oil*. Massage formula. With Extra Peanut Oil. Spectrum Peanut Oil. Spectrum ® Peanut Oil. Hi Oleic. Unrefined medium high heat. Non GMO Project Verified. nongmoproject.org. Our unrefined peanut oil is expeller pressed from lightly roasted peanuts for a taste and aroma akin to peanuts fresh from the shell. Toss it with warm soba noodles and slivered scallions for a aromatic sensation, or pour it in a pan with slices of squash and sweet onions. Gild anything with its rich, nutty flavor for a dish that's as good as gold. Different oils have different uses, and each performs best with a certain range of temperatures. Some are made for high heat cooking, while others have intense flavors that are best enjoyed by drizzling directly on to food. 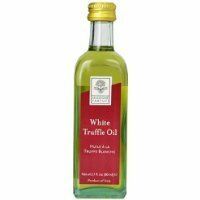 This oil is best for sauteing or pan-frying over medium-high heat or, because of its full body, in sauces and salad dressings. Oil product of USA. Packaged in the USA.A non-hydrogenated fat food*See nutritional information for total fat and saturated fat content. Hain Celestialâ ¢.800.343.7833.www. spectrumorganics.com. 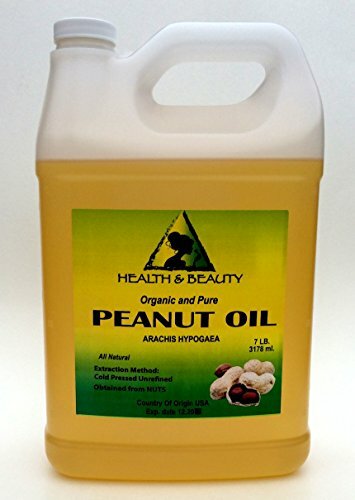 ©2015 The Hain Celestial Group, Inc.
Peanut Carrier Oil - 10 Litres - 100% Pure Botanical Name: arachis hypogeae Plant Part: nut Extraction Method: cold pressed Country of Origin: Australia Description/Specification: Enjoy the sweet nutty scent! Peanut Oil is extracted from Australian peanuts through the method of cold pressing. Peanut oil is used widely in skin care formulations for its moisturising properties and its sweet, nutty fragrance. Avoid use of Peanut oil if allergic to nuts. Extraction Method: Cold Pressed. Processing Type: Unrefined. Obtained From: Nuts. Ingredients: Peanut oil, 100% Pure, NO additives or carriers added. Color: Pale yellow to golden yellow liquid. 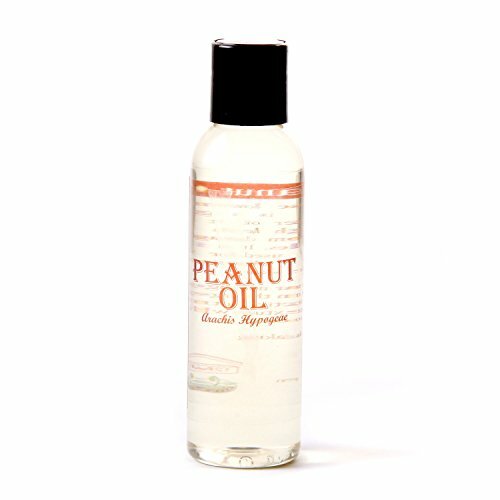 Aromatic Description: Peanut Carrier Oil Unrefined has scent of fresh roasted peanuts. Common Uses: Peanut Oil comes from ground peanuts. This oil commonly used in making soaps and used in massage oils and other massage products. Peanut oil is also high in vitamin E which is great for moisturizing the skin when used in soaps and other cosmetics. Also great for hair, and skin when ingested. Peanut oil contains high amounts of vitamin E and phytosterols which are essential to get rid of the free radicals in blood. Another benefit of peanut oil is that it contains linoleic acid which is a precursor of prostaglandins. Prostaglandins are essential to carry out several important functions in the body like contraction and dilation of blood vessels, and other muscles in the body. Those including peanut cooking oil in moderate amounts in their diet regularly, are also believed to maintain proper levels of cholesterol and maintain proper heart health. Peanut oil health benefits also include its use in the prevention of several disorders of the stomach, like digestive problems, constipation, diarrhea, etc. Other uses include: cooking, biodiesel, massage oils, soaps, and weight loss. We are buying our oils from organic certified supplier, made with organic ingredients. Shelf Life: Users can expect a shelf life of 1 year with proper storage conditions (cool, out of direct sunlight). Your item(s) will be shipped the same business day or next business day of confirmation of payment if received by 3:00 pm PST. (not including weekends or holidays). When you receive your item and are pleased with our transaction, please let us know by leaving positive feedback, we will do the same for you in return. Look forward to do business with you, H&B OILS CENTER Co.
Botanical name: Carya Illinoinensis. Extraction Method: Cold Pressed. Processing Type: Unrefined. Obtained From: Nuts. Ingredients: Pecan oil, 100% Pure, NO additives or carriers added. Color: Pale yellow to golden yellow liquid. Aromatic Description: Pecan Oil Unrefined has scent of fresh roasted nuts. Common Uses: Pecan Oil comes from nuts. This oil commonly used in making soaps and used in massage oils and other massage products. Pecan oil is also high in vitamin E which is great for moisturizing the skin when used in soaps and other cosmetics. Also great for hair, and skin when ingested. Pecan oil contains high amounts of vitamin E and phytosterols which are essential to get rid of the free radicals in blood. 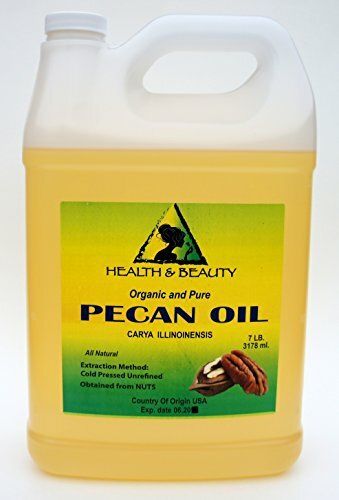 Another benefit of Pecan oil is that it contains linoleic acid which is a precursor of prostaglandins. Prostaglandins are essential to carry out several important functions in the body like contraction and dilation of blood vessels, and other muscles in the body. Those including pecan cooking oil in moderate amounts in their diet regularly, are also believed to maintain proper levels of cholesterol and maintain proper heart health. Other uses include: cooking, biodiesel, massage oils, soaps, and weight loss. We are buying our oils from organic certified supplier, made with organic ingredients. Shelf Life: Users can expect a shelf life of 1 year with proper storage conditions (cool, out of direct sunlight). Your item(s) will be shipped the same business day or next business day of confirmation of payment if received by 3:00 pm PST. (not including weekends or holidays). When you receive your item and are pleased with our transaction, please let us know by leaving positive feedback, we will do the same for you in return. 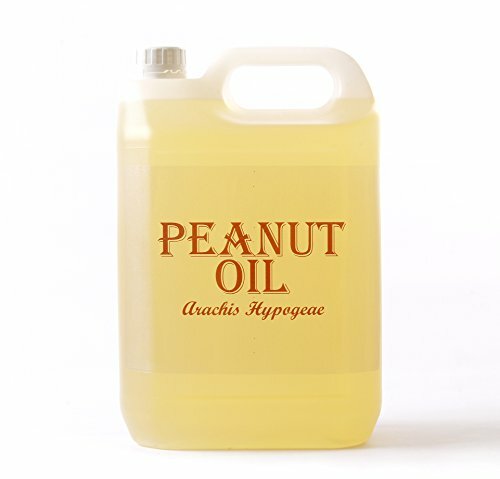 Look forward to do business with you, H&B OILS CENTER Co.
Peanut Carrier Oil - 5 Litres - 100% Pure Botanical Name: arachis hypogeae Plant Part: nut Extraction Method: cold pressed Country of Origin: Australia Description/Specification: Enjoy the sweet nutty scent! Peanut Oil is extracted from Australian peanuts through the method of cold pressing. Peanut oil is used widely in skin care formulations for its moisturising properties and its sweet, nutty fragrance. Avoid use of Peanut oil if allergic to nuts. Extraction Method: Cold Pressed. Processing Type: Refined. Obtained From: Nuts. Ingredients: Peanut oil, 100% Pure, NO additives or carriers added. Color: Pale yellow to golden yellow liquid. Aromatic Description: Peanut Carrier Oil has very little scent characteristic of most carrier oils. Common Uses: Peanut Oil comes from ground peanuts. This oil commonly used in making soaps and used in massage oils and other massage products. Peanut oil is also high in vitamin E which is great for moisturizing the skin when used in soaps and other cosmetics. Also great for hair, and skin when ingested. Peanut oil contains high amounts of vitamin E and phytosterols which are essential to get rid of the free radicals in blood. Another benefit of peanut oil is that it contains linoleic acid which is a precursor of prostaglandins. Prostaglandins are essential to carry out several important functions in the body like contraction and dilation of blood vessels, and other muscles in the body. Those including peanut cooking oil in moderate amounts in their diet regularly, are also believed to maintain proper levels of cholesterol and maintain proper heart health. Peanut oil health benefits also include its use in the prevention of several disorders of the stomach, like digestive problems, constipation, diarrhea, etc. Other uses include: cooking, biodiesel, massage oils, soaps, and weight loss. We are buying our oils from organic certified supplier, made with organic ingredients. Shelf Life: Users can expect a shelf life of 1 year with proper storage conditions (cool, out of direct sunlight). Your item(s) will be shipped the same business day or next business day of confirmation of payment if received by 3:00 pm PST. (not including weekends or holidays). When you receive your item and are pleased with our transaction, please let us know by leaving positive feedback, we will do the same for you in return. 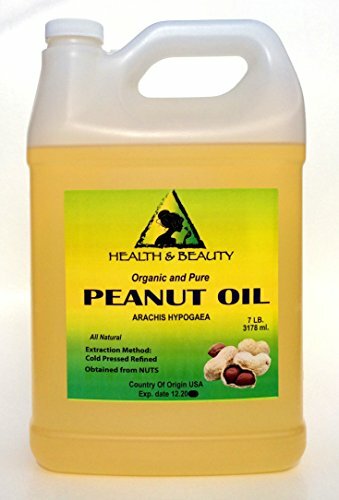 Look forward to do business with you, H&B OILS CENTER Co.
Peanut Carrier Oil - 250ml - 100% Pure Botanical Name: arachis hypogeae Plant Part: nut Extraction Method: cold pressed Country of Origin: Australia Description/Specification: Enjoy the sweet nutty scent! Peanut Oil is extracted from Australian peanuts through the method of cold pressing. Peanut oil is used widely in skin care formulations for its moisturising properties and its sweet, nutty fragrance. Avoid use of Peanut oil if allergic to nuts.